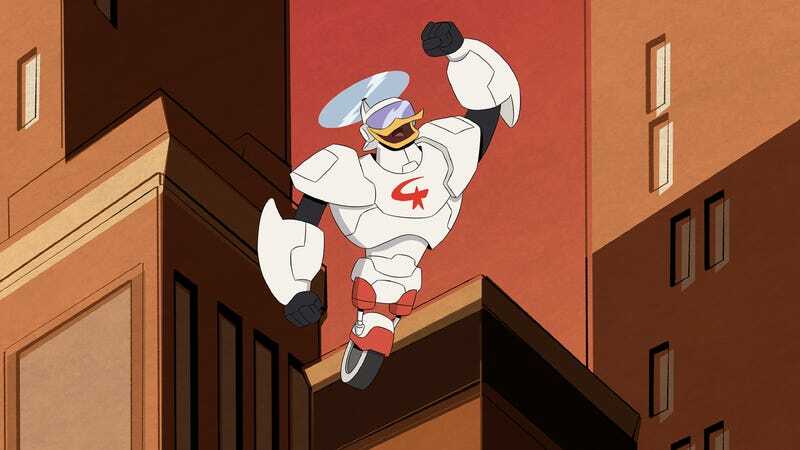 There is a lot of potential in “Who Is Gizmoduck?” There’s the story of a young intern who has access to power beyond his imagination (power, responsibility, etc.). There’s the story of an even younger duck who believes in the hero who saved him, only to be disappointed in what he sees, but to also inspire said hero to do what’s right. There’s the story of a renegade robot hero saving the day outside of the duties of the police. There’s the story of how the news and social media can contort and manipulate coverage of said hero to make it seem like they can be figures for good, or evil. There’s the story of two competing brilliant but deranged scientists, who use/don’t use the power of Gizmoduck to suit their selfish needs. If this was a movie, or let’s say, a five-part, multi-arc series of episodes, it could have done all those storylines justice. But squeezing all those elements within a twenty-two minute episode make for a rather messy display. Christian Magalhaes’s script tries for all those things, but never hones on a specific element to work with. The title, “Who Is Gizmoduck?” suggests that this is ultimately about Fenton coming to terms with his lackluster, confusing place in life and embracing his heroic status as Gizmoduck. It begins with a bank robbery gone wrong, when Fenton-as-Gizmoduck thwarts the Beagle Boys, only to lose control and blow up the bank itself (he even sets the money on fire, but I have no idea why the bank teller begins rolling back and forth on the ground, other than it looks funny). Then Roxanne Featherly reports the story in that terrible-writerly way that just ignores the initial crime in order to be sensational and make Gizmoduck look bad (I know that’s part of the joke/satire, but it comes off as an irritating beat nonetheless). Huey sticks up for the hero though, since he did save his life, and seeks to find out more about him. Within the first five minutes, we have a lot of of stories and themes up in the air. Then in comes Fenton’s mom, Officer Cabrera, who is voiced by Orange is the New Black’s Selenis Leyva. Fenton’s mom has changed from the extremely perceptive, trailer-trash stereotype from the old show to a completely oblivious police officer, and while Leyva was an okay job in the role, she is given nothing to work with, spending most of the time belittling Fenton’s internship (sure, it’s unpaid but he’s also working for the riches duck in the world) and otherwise missing all the signs that her son is Gizmoduck. Again, I get that that’s the joke, but making Fenton’s mom a cop suggest a deep conflict between the law solving crimes and vigilantes solving crime, backed by complex family dynamics, but that doesn’t happen. The episode sort of kicks into gear when Mark Beaks comes into play, who ended “Beware The B.U.D.D.Y. System!” obsessed with Gizmoduck. For brief moments, that darker, controlling, power-hungry Beaks shows up, working on his plan to get his hands on the suit in a clever way–planting the seeds of a more heroic, idealized portrayal of Gizmoduck under his leadership, as opposed to the blunt, no-nonsense refusals from Gyro. There’s a lot of potential here: Gyro’s constant putdowns of Fenton inspiring the young intern right into the clutches of Beaks’ hands, despite the fact that Gyro is one hundred percent right about the dangers of the suits nuclear core processor. It’s clear a more grudging respect between Gyro and Fenton could have mitigated the conflict, especially since Fenton seemed capable of controlling the suit despite its danger. But the episode isn’t interested in that aspect. As far as I can tell, Gyro still hates Fenton by the end of the episode. With the big Waddle device on Gizmoduck’s chest, Fenton is forced to do consumer-selected jobs from the app, mostly boring ones. It feels like a waste of a narrative though. You have access to the most powerful suit in the world and you send it to do odd jobs? Huey even calls him only to tell him he’s a sellout, despite the fact that Fenton is essentially doing all this against his will, but that’s really neither here nor there since Huey feels like such an outlier in this episode (the show continues to struggle with the red-cladded triplet). He does ultimately come up with the way to bypass the core processor, by using Fenton’s brain, after Beaks rips the suit from Fenton, drives it, and almost self-destructs the suit himself. It’s all somewhat rushed, and even watching Fenton embrace himself as the true heroic Gizmoduck (with Scrooge’s blessing and Gyro’s reluctance) can’t hide the cluttered, scattered direction the episode took to get us there. It isn’t clear who knows Fenton is supposed to be Gizmoduck or not. By the end of the episode, I can assume everyone who’s necessary knows, but during the episode, who knows what is never clarified. The scene where Gizmoduck saves Beaks from the helicopter seems really weird to me. Like I was kind of thinking that Beaks was flying by on purpose to be saved so that he could begin planting those seeds to get Fenton on his side. But that doesn’t seem to be the case, which means it really was just forced narrative coincidence. I couldn’t help but think that maybe there’s a lesson in Gizmoduck helping average citizens with minor issues, which would have worked even better within a story about cops vs. vigilantes. 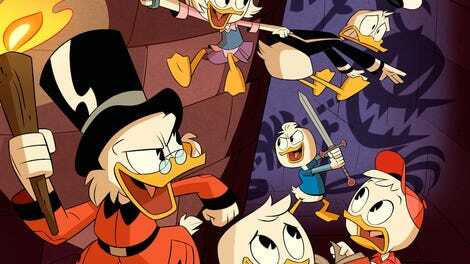 But DuckTales is an outsized show–its heroes being big, bold, and non-legal is all part of the world. So of course the things that Gizmoduck does are all super boring. Asking for nuance is a tall order, even though the show has done it before. It’s either be an amazing super hero or a butler-on-call.